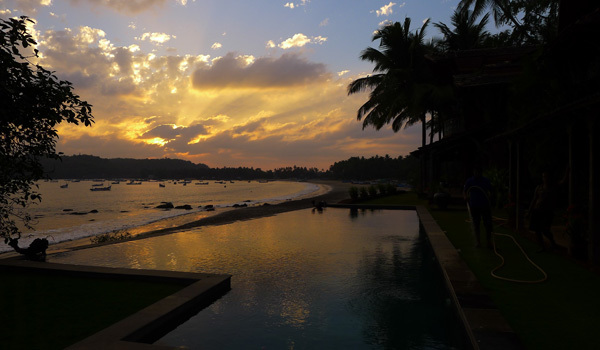 Recently, Greaves’s own Tanya Dalton paid a visit to Goa, where she was invited to stay at the newly opened Ahilya by the Sea. Below, read her first-person account of her holiday – and of this magical hotel. 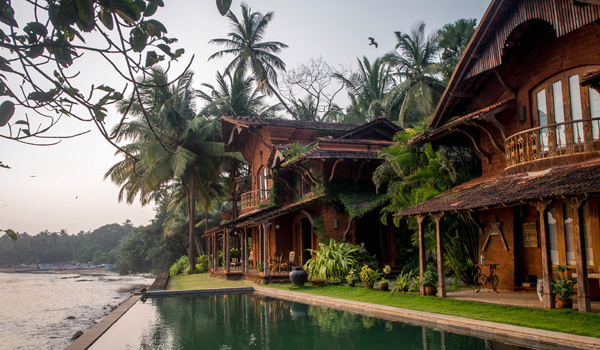 Whilst escorting a press trip, I was honoured to be among some of the very first guests to stay at the beautiful Ahilya by the Sea in Goa. Opened only a few months ago, the boutique hotel, tucked away in a placid fishing village, is already attracting buzz. 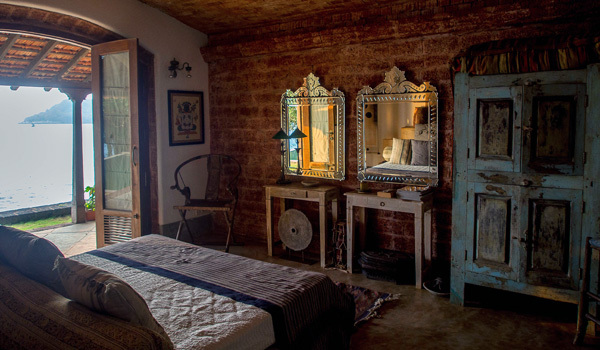 From the owners of the striking Ahilya Fort in Maheshwar, Madhya Pradesh, including the visionary Mrs. Leela Ellis, this new hotel offers the perfect opportunity to discover Goa’s less travelled side. 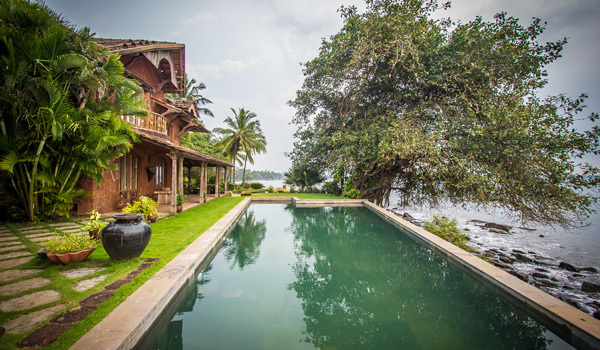 Ahilya by the Sea is a magical enclave positioned just off the edge of Coco Beach, near the quiet fishing village of Nerul. Comprising just three villas – one of which is complemented by a personal tree house, where guests rest under the dappled shadows of one of the property’s mighty banyan trees – the small-scale hotel cultivates an air of privacy. The other two villas, Sunrise and Sunset, offer clean, whitewashed rooms with large beds, pretty tiled bathrooms and balconies that can be flung open to invite in the blustery sea views. 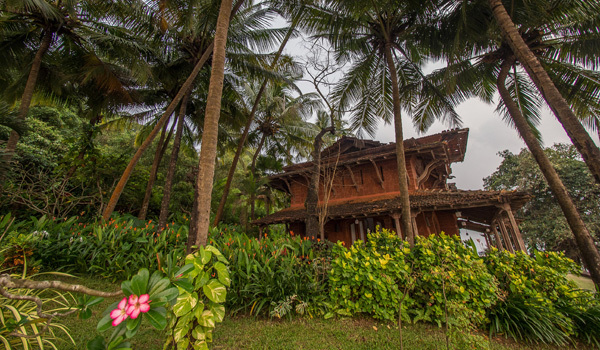 Each has been lovingly decorated with handpicked antiques of Indonesian and Indian design. Sunrise Villa has three air-conditioned, en-suite bedrooms with a private dinning room and covered veranda. I loved that the villa also hides a tiny reading nook with a little day bed and expansive views of the sea – the perfect way to spend a lazy afternoon. Sunset Villa, meanwhile, is a little more spacious: here, guests will find four sea-facing, air-conditioned bedrooms, a large family room and fully equipped kitchenette. Personally, I found the bedrooms utterly charming. As each room opens directly onto the sea, it’s certainly hard to argue with the stunning floor-to-ceiling views! The hotel is based at the confluence of the Mandovi and Nerul Rivers, where they spill into the Arabian Sea. The picture-perfect ambiance was helped along by bowing coconut palms and the colourful fishing boats happily bobbing along in the water. That said, it’s tempting to stay on-site. The property has two generously sized pools, and works very much like three independent villas. Then there’s the cuisine: daily delights comprise fresh produce and the local catch of the day, all of which demonstrate Indian flavours alongside delicate French sensibilities. Despite the nearby fishing beaches offering great walks and lively scenes, the area’s best beaches are further north along the coast. Hire a moped, then, and spend the day watching the tourist traps of north Goa melt away into the hungry jungle of coconut palms and surrounding forest. Morjim Beach is well worth lounging for the day, and even further north at the edge of the state, you can hop on a ferry and ride over to the enchanting Fort Tiracol. The landmark has recently been refurbished and, with its smart interiors, beautifully dilapidated exterior and tiny living church, it’s more than photogenic. 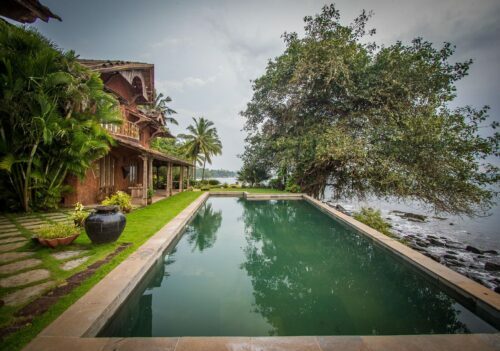 Just don’t forget to head back to the hotel when you’re done – this quiet haven is a perfect place to experience Goa’s gorgeous scenery and uniquely unhurried pace of life.